Look to FilterChem for reliable, quiet, convenient and economical collection and transfer stations. 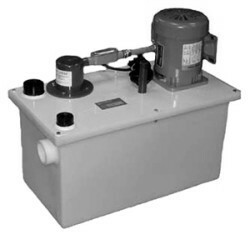 Use where gravity drains are not available or where you want to collect corrosives by production machinery for periodic transfer to clarifiers or storage tanks. We can build you a special size to your requirements. Vertical Pumps from CPVC or Polypropylene have no seals or bearings in solution. A FilterChem™ Level-Controller guarantees reliable automatic operation. Operation is simple. When collection station fills, our FilterChem™ Level-Controller automatically signals the pump to start thereby emptying the pumping station. When it is empty, the level controller signals the pump to stop and the cycle repeats.